In my work as the Vermont Field Agent for Land For Good, I work with both farmers looking for land and non-farming property owners who are looking to make their land available for agriculture. One of the first things that I often ask about is the types of soils on the properties that are under discussion. In many cases, the first response that I get is, “We have sent soils out to be tested.” But soil tests answer a different question than what I am asking. While soil tests identify soil fertility and organic matter, they do not identify the soil types, known “soil series”, as categorized by the USDA. The soil types, such as “Hadley Silt Loam” or “Vergennes Clay” or “Cabot Stoney Loam” or “Windsor Loamy Fine Sand” are based on characteristics influenced by the formation of the soil over geologic time. The characteristics of a given soil type will influence aspects such as tillage, drainage, native fertility, and yield potential. 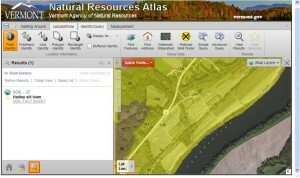 A relatively new tool available in Vermont, the Vermont Natural Resources Atlas, can be used to map soils as well as other features of use to farmers such as property boundaries, acreage and flooding hazards and much more! This post provides some illustrations of various maps of farm resources that may be helpful, followed by a link to a tutorial on how to use the Atlas. 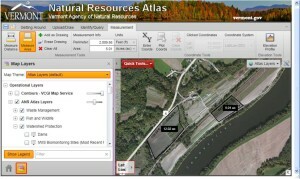 Below is a soil map generated using the Atlas of farmland along the Connecticut River in Westminster, VT. Information on individual soil types, known as “Soil Fact Sheets”, can also be retrieved from this site, as illustrated here. The Atlas map below shows wetlands and flood hazard potential. Indeed, this farmland and section of US Route 5 did flood in 2011 after Tropical Storm Irene causing the farmers to lose tens of thousands of dollars of crops. Fortunately the house and barn were not lost, despite being mapped in the hazard zone. The farmers continue to farm this land because it is highly productive, but they are keenly aware that flooding is likely to occur again. 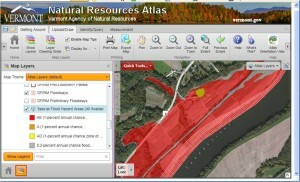 The following map illustrates how the Atlas can be used to generate a map of field acreage. Spend some time exploring this highly useful resource and you will likely find other features of your property of interest to map. Having information on soils, flooding, and acreage will help you to better understand the agricultural potential of any farmland that you are considering, as well as alert you to hazards. Having maps of the land that you are farming, or that you are considering leasing or buying, will help service providers, like myself, help you evaluate the property and assess whether it’s a good fit for your needs. For more assistance on mapping your property or for assistance with farmland access, purchase, and leasing issues in Vermont or elsewhere in New England, learn how we can help and contact us. Maine FarmLink event; like speed dating? As we struggle to shift the balance of our income from our off-farm employment to that of our expanding business, the services offered by LFG at no cost to ourselves made for an easy decision to participate.